Hard to believe that a week has past. An amazing week of incredible beauty. 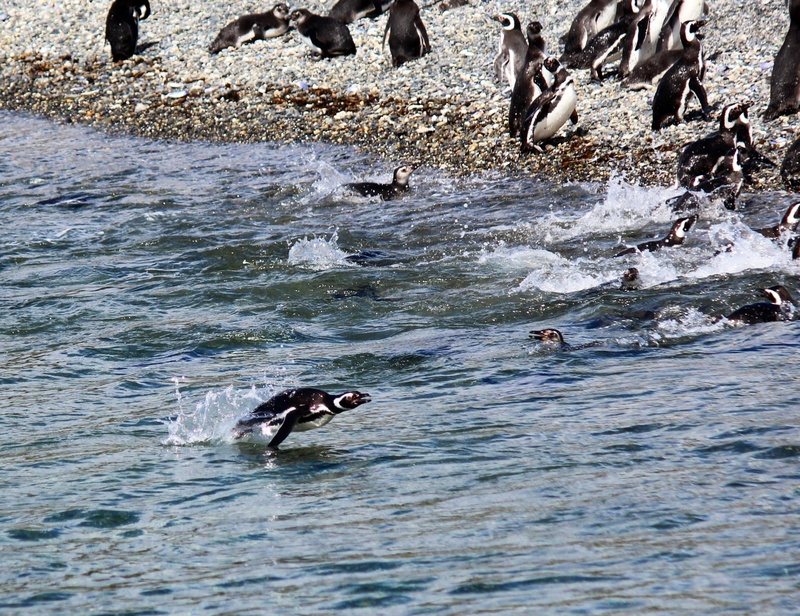 A week of developing a deep appreciation of ice, penguins and the soul of the Antarctic. It is difficult to describe this place and impossible for a camera to capture it adequately. However we hope that the photos will give you at least a sense of the grandeur. To me it seemed like the way the world was when everything began. 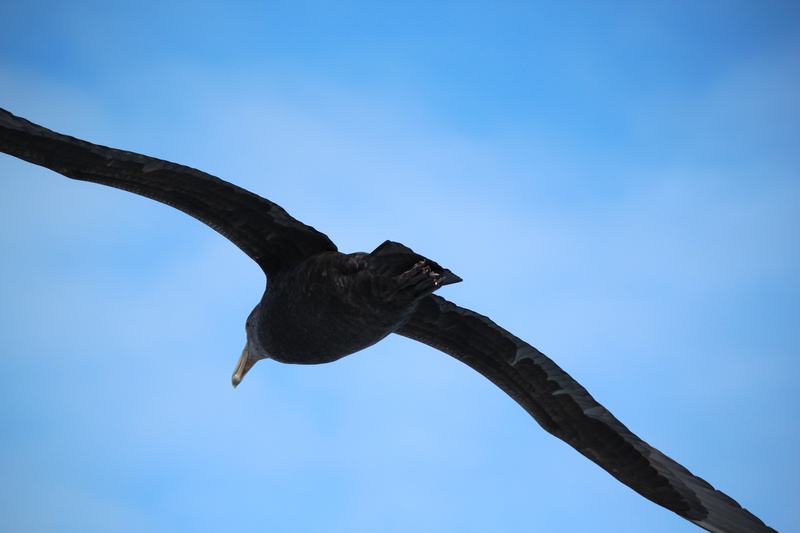 Following the Drake rite of passage, our journey continued in the South Shetland Islands . Excursions went out from the ship 2X a day. 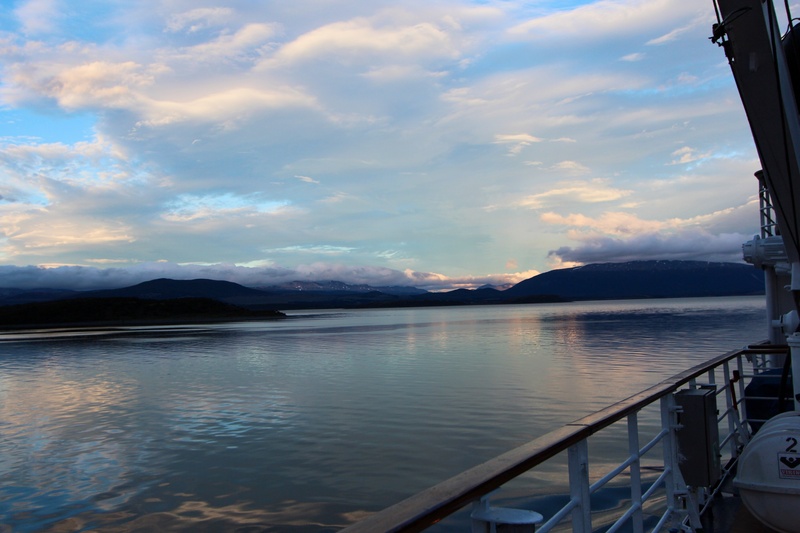 A hike often started our day and a zodiac cruise rounded out the afternoon. We visited penguin rookeries, had magical ice berg cruises, saw whales ( orcas, humpbacks and minke ), seals and the great wandering albatross. A lot of the time I just sat and tried to take it all in. The Sun set at midnight and rose at about 2:30 am – it never was entirely dark. We managed to capture both on camera. Our time on the Antarctic peninsula was spent hiking up to penguin colonies which were often 1000 meters above sea level on rocky outcrops with spectacular views. We were incredibly well taken care of by Quark and I recommend them whole heartedly to anyone planning a trip to the Antarctic. The quality of food, care, expertise was outstanding, as was attention to detail in every aspect of safety and ship management. One caveat – the Antarctic is not wheelchair friendly. You will get the most out of the trip if you are reasonably fit. I hope you enjoy the photos of the South Shetland Islands and Antarctica – it truly is the end of the world as we know it in more ways than one. 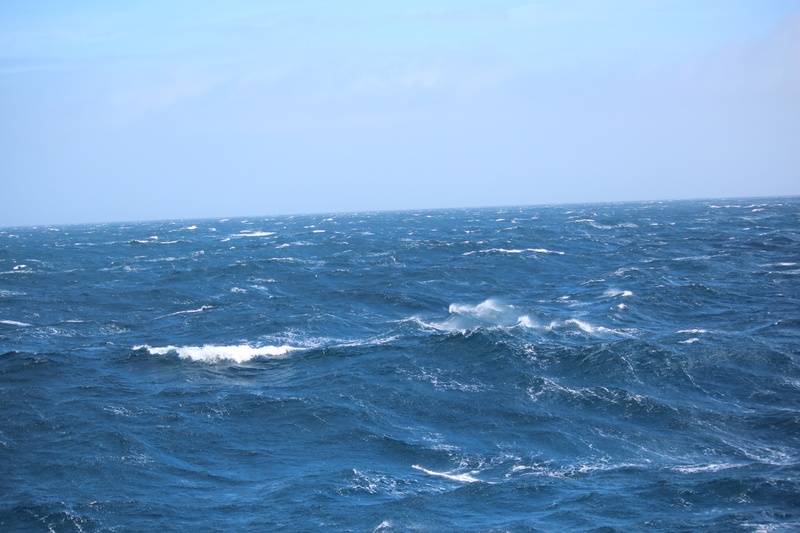 At it’s extremes the Drake passage is referred to as the Drake Shake or the Drake Lake. With a fresh 15-30 knot wind and and the rolling of the ship in 15 foot swells we are some where in between. There are 85 of us on this ship and we look like cast members from The Living Dead as we struggle to find our sea legs. Thank heavens for Gravol – a lot of people are sick at the moment. If you go take your sea sick meds – even if you never get sick. The are bags in every conceivable area on board the ship in case people get caught away from their cabins. Interesting touch….. The food is excellent and the staff are top notch. We have been attending a number of lectures on birds and animals found in the area. The sun is rising at about 3:50 am and sets about 10:30 pm -so lots of daylight to watch the dozens of sea birds following the ship. The ships historian also gave an excellent talk on the early history of European discovery of the Antarctic which occurred in 1820. . My respect for the first European explorers who went through this passage has increased substantially – the pounding the boats and the men took must have been dreadful. … Drake Passage was named after Sir Francis Drake who was the first man to circumnavigate the globe going in one direction. After the lectures we did the bio-security check of our outdoor clothing and shoes. 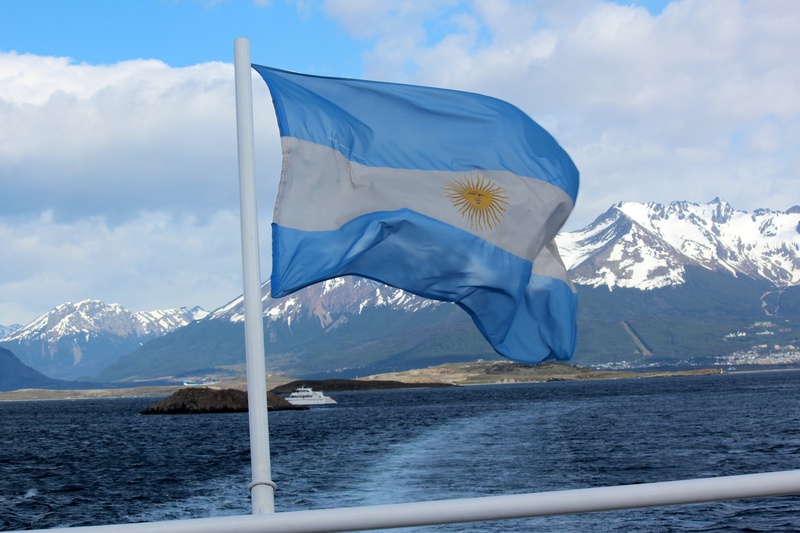 This is compulsory to go ashore in the Antarctic to ensure that no foreign plants or animals are introduced to the environment. We have one more day at sea and then we will be in the South Shetland islands. We are looking forward to getting out of these seas. OK – day 2 at sea. Still seeing the zombie waddle but we are getting our sea legs. Seems that every 20 waves or so a particularly big one comes along. You get in the rhythm of it after a while. We had to “drake proof” our cabin as the rolling sends glasses, phones, tablets, anything not in a drawer or nailed down sliding across the cabin floor. 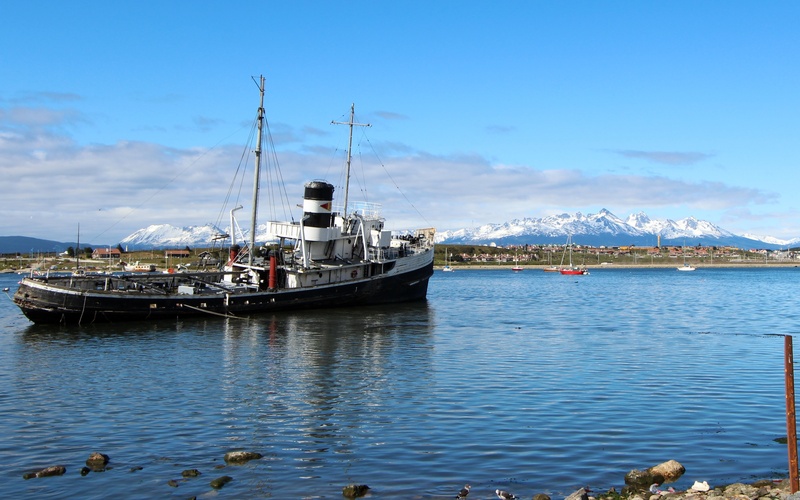 Another day of rare good weather in Ushuaia for our trip down the Beagle Channel. The channel was named by Captain Fitzroy of the Beagle who Darwin sailed with. I was trying to imagine Darwin’s thoughts as he sailed down the channel for the first time. 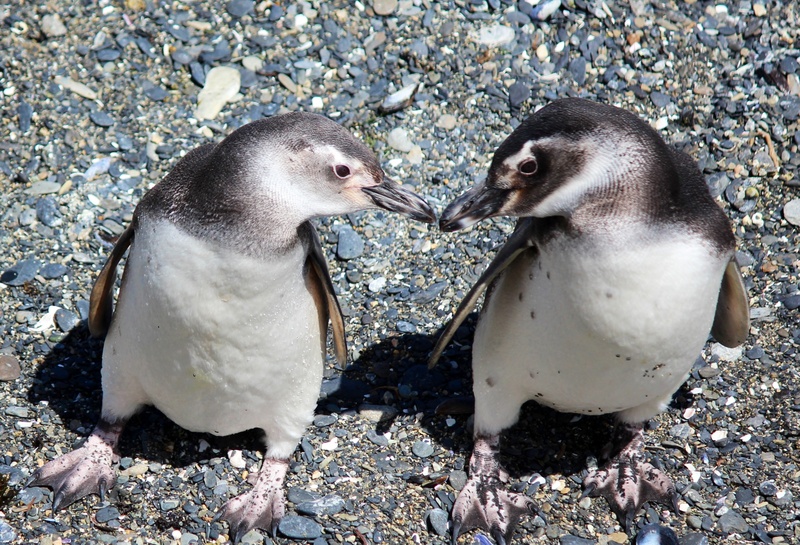 Our first penguin colony greeted us today. The catamaran we were aboard ran right up on the beach by the penguins and we spent a lovely 30 minutes with the little birds before heading on our way. Our trip meeting is tonight and we board our ship tomorrow. Will be out of Internet range until the 19th – hope to load Antarctic photos and blog in Chile when we stop over in Puento Arenas. 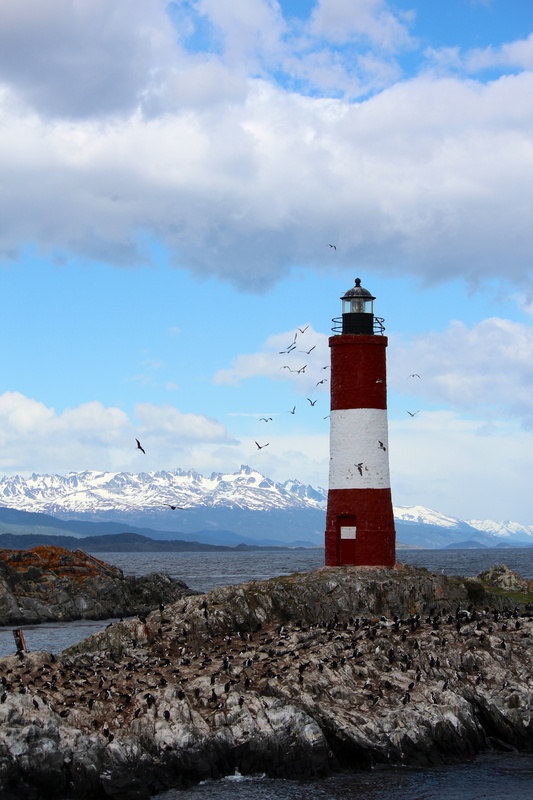 Today was a wonderful day in Tierra del Fuego national Park. Human habitation goes back here almost 10,000 years. The Yamana people lived along the coast living on sea mammals and fish. 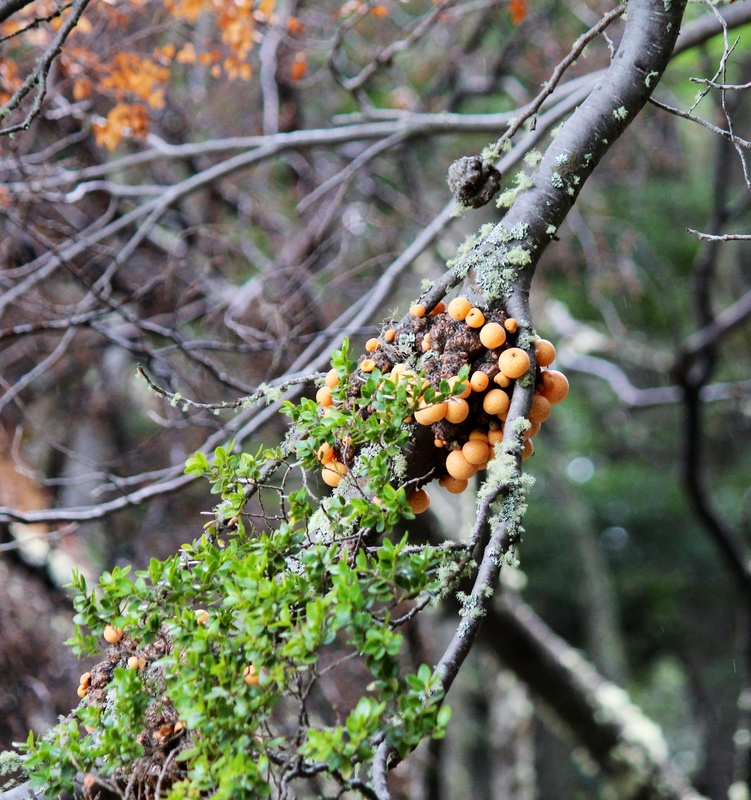 We also had the opportunity to taste some of the mushrooms and other native plants that they ate during our trek today. There were 3000 Yamana in 1880, 1000 in 1890 and about 100 left in 1910. Disease and genocide by settlers and sealers was the main cause. Today there is one 85 year old woman who still speaks the Yamana language. 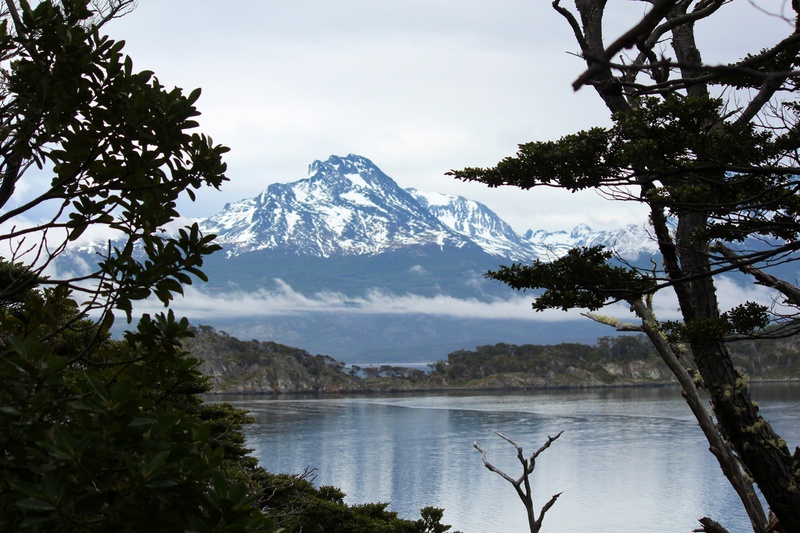 The scenery along the route of our trek was incredible as we walked through forests and along beaches bordering the Beagle Channel. A lot of similarities between the PNW coastal forests and a lot of differences. Same windblown trees – no conifers though – three types of Beech trees – 2 deciduous and one evergreen, lots of plants in miniature. Climate here is pretty uniform. 10 degrees C average in summer, 0 degrees C average in the winter. Had an awesome morning walking around taking photos. The town has a lovely memorial to the Argentine soldiers that fought and died in the Falkland Islands. We got up high enough in the town to take some nice photos of the area and surrounding scenery. 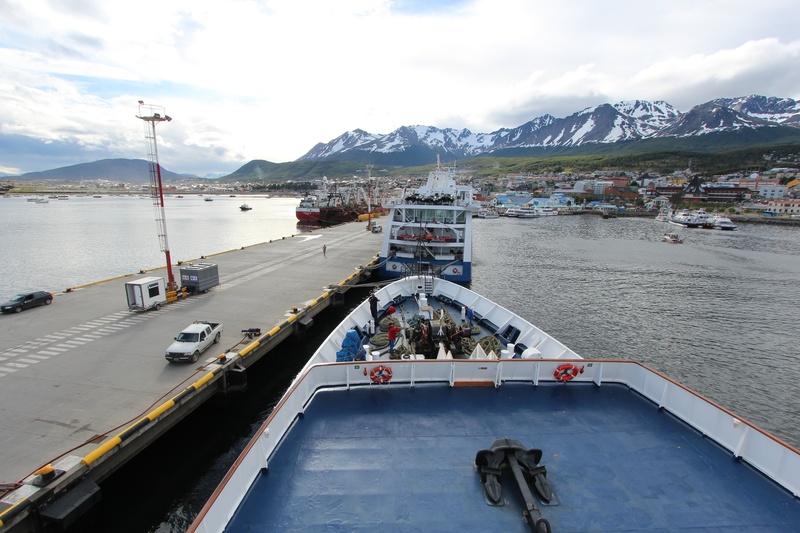 Ushuaia is a very busy cruise ship terminal – ships that travel to the Antarctic and those that circumnavigate the tip of South America. The day is sparkling sunshine – excellent day for taking photos and leisurely exploring the town. 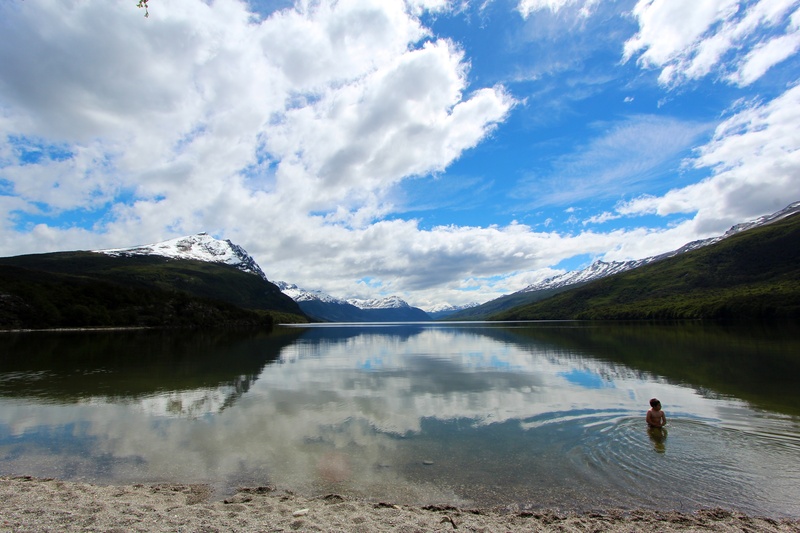 Taking it easy today as tomorrow we have a trek and canoe trip in Tierra Del Fuego National Park. After a lovely sleep in we were driven to the airport in Buenos Aires for our onward flight to Ushuaia. Our guide very kindly drove us through some upscale residential areas on the way to the airport. you can live very nicely in Buenos Aires if you have lots of money. The airport is located right alongside the river that runs from Iguaza Falls – it is dark brown and pretty awful looking. Th airport was incredibly crowded and we just got checked in in time – our first inclination of trouble was when we went to the gate listed on our boarding pass and nothing happening, nada. A quick check of the departure board showed our flight delayed until 4:45 am the next day. Turned out both the board and our our boarding pass were wrong – we found the correct gate and the flight left only about 1/2 hr late. As we were sitting onboard we were informed that the plane was refuelling so no one was to smoke, all electronic devises were to be turned off, the doors were left open and we were not to put our seat belts on in case a hasty exit was required. Just after that -both of us feeling full of confidence by this point 🙂 – the old bucket of bolts waddled down the runway and was airborne. The landing gear badly needs some WD40 on it’s next scheduled maintenance. 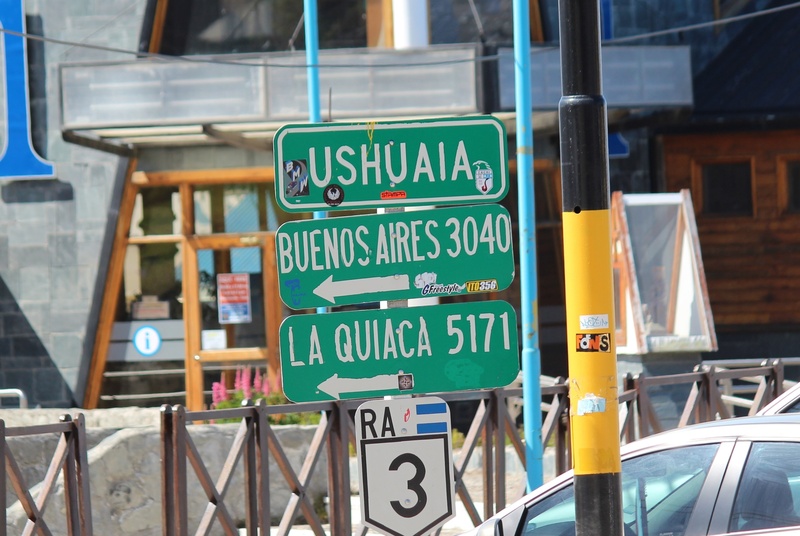 Ushuaia – we made it!!!! A small Port city of 70,000 people – cold raw, clean air – just like home 🙂 We both fell in love with it the minute we landed. We needed to take a cab to town and flagged one down that was driven by Atilla the hunlet. The old adage get an agreement before you step into a cab served us well here. First of all she told us her meter was broken and it was $35 USD to town and then she tried to force us into the cab- don’t think so – we got a translator, Carol refused to get into the cab until the price was clear -all of a sudden presto – her meter worked – $8 to get to our hotel. 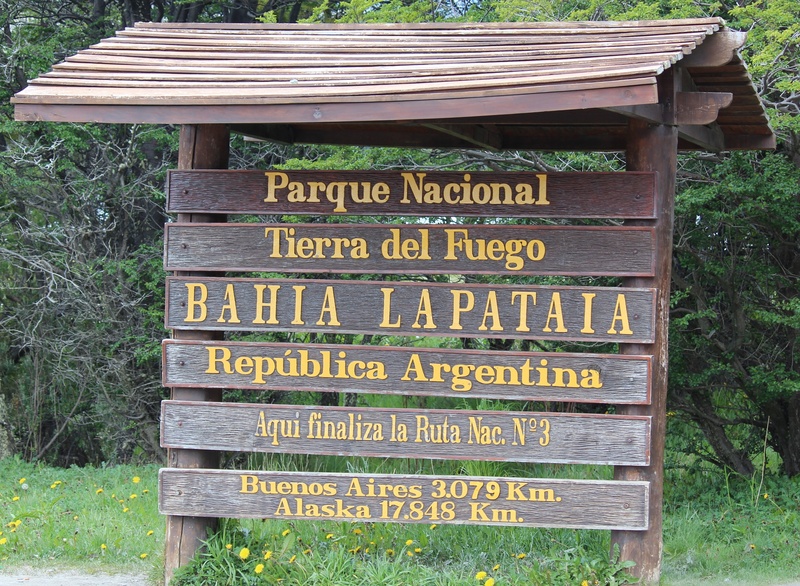 I took some photos on the way in to town – we hope to walk around town tomorrow and them Monday we head to Tierra del Fuego National Park. Traveling through La Paz to the airport at three am in a cab driven by a driver over stimulated by coca leaves was interesting…. The cabbie spoke no English and our spanish is pretty rudimentary – charades come in handy. Anyway we got there – and after filling out forms, more forms, paying to leave and then yes you guessed it more forms, we got our bags searched by narcotics police and finally got on the plane. Get to the airport early if you go….. Some South Americanisms we have picked up on our trip so far. 3) No problem, I’ll take care of it,don’t worry – translation – time to get out of Dodge…. Our flights went fine – I had three seats to myself on the Lima to Buenos Aires haul and Carol had 2 – so we caught up on some much needed sleep. Buenos Aires is like most other big cities 14 million of the 42 million people n Argentina live here. Our driver took us the circuitous route to our hotel so we had a chance to see the outlying slum areas and then the inner city around the main square including the pink palace which is lit with pink lights at night. After a rest at our hotel we were picked up at 8:30 for a gourmet dinner and tango show. Fabulous dinner and fabulous show. 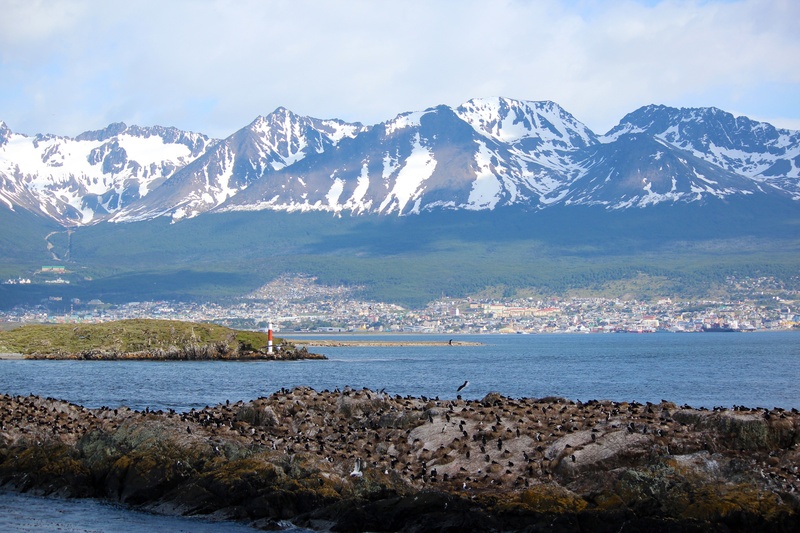 On to Ushuaia tomorrow.